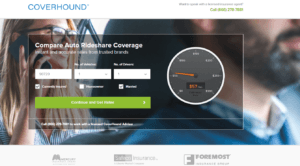 CoverHound is getting into the rideshare insurance business. The online insurance comparison shopping platform has partnered with several large carriers to offer auto insurance quotes in 24 states for people who drive for rideshare services like Uber and Lyft. The San Francisco, Calif.-based insurtech company said it intends to expand the service nationwide at the end of the year. 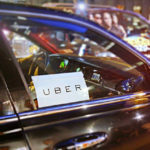 Keith Moore, CEO of CoverHound, which is in its seventh year of operation, said the need for offering rideshare insurance became apparent to him and other executives at the company who travel often and use a ridesharing app to get around. He said he got the impression after numerous rides that drivers are in need of education on rideshare insurance, the requirements to carry it, and the benefits of having it. “We just noticed there’s still a lot of confusion,” Moore said. Harry Campbell, a rideshare expert who goes by the handle the Rideshare Guy, has been calling for more rideshare insurance coverage for the past few years. He thinks CoverHound’s new platform will help more drivers obtain the proper insurance. CoverHound launched its new online insurance shopping portal on Apirl 19, 2017. The Property Casualty Insurers Association of America, which worked with states across the country to help develop insurance regulations for transportation network companies, also believes CoverHound’s new online tool will be beneficial. A big selling point for the portal appears to be CoverHound’s promise that rideshare drivers can get a quote in five minutes. Next up is a page to input the year, make and model of the vehicle, which when filled in prompts a pulldown with required selections like “Ownership,” “Primary Use,” “Miles driven per year,” and whether the vehicle is used for a rideshare program. The driver’s name, date of birth, gender and whether that person is the primary driver are also required. Users can add drivers and vehicles. Other queries include: Career status; occupation; highest level of education; marital status; age when the driver first obtained a license; status of the driver’s license; whether there has been any suspensions within five years; recent incidents; owning a primary residence; if a driver is currently insured; current carrier; length of time being continuously insured; current coverage limit; how much the driver pays every six months; home address; email; VIN; driver’s license number; annual mileage; whether the vehicle is paid for. An autofill function starts when the user begins typing in the appropriate box. To get an example of how the site works, a 2000 Nissan Pathfinder driven by a married male living in Orange County, Calif., was used. A quote from Mercury at $497.96 for six months for “Superior Coverage” was quickly delivered after following the prompts. “Minimum Coverage” cost $484, “Basic Coverage” was $429 and “Deluxe Coverage” was $571. Any of those choices was available. According to Moore, a shopper score on the backend helps determine the type of coverage offered. The Pathfinder generated a “Superior Coverage” offering because a high value shopper score was returned, which indicates more coverage was of greater importance than price to the shopper. That page also gave the option to call Foremost for a quote, and there’s a “Need some help? Let’s chat!” icon available. The coverage returned on the Pathfinder quote included primary liability limits of $100K/$300K, property damage for up to $50,000, and medical payments of up to $1,000. It also included uninsured liability for BI limits of $100k/$300k and property damage up to $3,500. Users are given an option to edit coverages, payment options and they can apply discounts for things like education and umbrella. Insurance can be bound online with a final click, Moore said. “We handle it 100 percent online,” he added. Users can also call to obtain a policy. The top of the hompage offers a number for consumers to speak to an insurance agent. CoverHound said it has licensed insurance agents standing by to take calls. Christopher J. Boggs, executive director of the Big I Virtual University for the Independent Agents and Brokers of America Inc., believes that bypassing an agent is rarely a good idea considering most insureds have some unique exposures that cannot often be discovered and properly addressed in an online conversation or in a 15-minute phone call. However, while insuretech is the current trend, Boggs is of the opinion that eventually the luster will wear off. “These firms are PR machines, I’ll give them credit for that,” he added. While quick and easy insurance quotes may appeal now to a younger generation, the relationships between an agent and an insured will grow increasingly important as a young person’s life changes, Boggs said. “And so, too, will their desire to know their agent,” he added. The three carriers listed on the site’s homepage are Mercury Insurance Group, Safeco Insurance and Foremost Insurance Group. Other carriers involved are Progressive, State Auto, CSE Insurance, Kemper and National General Insurance, according to Moore. “As carriers add more products, we’re actively putting them on the platform,” he said. All the partner carriers are offering their existing rideshare products, but that may soon change. “We may work with carriers in the future to have more specific products developed for the rideshare community,” Moore said. 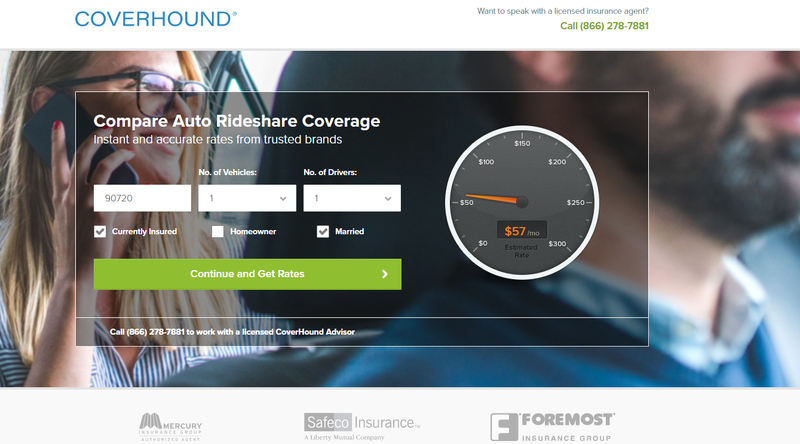 CoverHound doesn’t charge drivers for the service, instead earning a commission based on policy sales and renewals. According to Moore, the size of the commissions depend on the carrier. “We get the standard independent agent commissions on the backend,” Moore said. While this is another development in the rapidly developing insuretech craze, Moore doesn’t see the portal as a big revenue generator initially. “I don’t think it’ll be a huge percentage of or written premium in the next two years,” he said. He said creating the service was a way of generating more customer satisfaction. “Our goal is to make sure when customers come to us, we have an option for almost 100 percent of people who come through,” Moore said. States the service is currently being offered in are: Arizona, Arkansas, California, Colorado, Georgia, Illinois, Indiana, Kansas, Maryland, Minnesota, Missouri, Montana, North Carolina, Nevada, New Mexico, Ohio, Oklahoma, Oregon, South Dakota, Tennessee, Texas, Utah, Washington and Wisconsin.